A geyser element uses 3 or 4 kW of electricity per hour and a heat pump uses 1.1 kW or less per hour. So the heat pump will save you at least two thirds (67%) of your water heating costs annually. 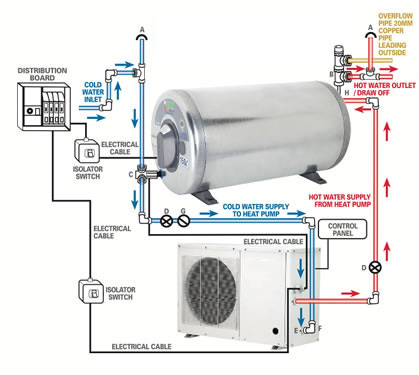 The fan draws warm ambient air into the heat pump across the evaporator transferring energy to the ice cold refrigerant up to room temperature. The hot gas is passed through a tube in one direction and cold water from your geyser flows in the opposite direction so that transfer of hot energy to cold water occurs – this warms up the water. In this manner our 5 kW output heat pump produces 120l of hot water per hour (when ambient temperature is above 20 degrees C and heats the water from 15 – 55 degrees) – A heat pump does work in cold weather – as low as -4 degrees. 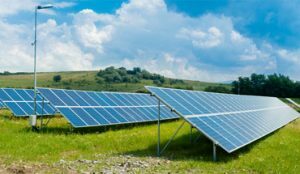 WHAT ARE THE ADVANTAGES OF HEAT PUMPS OVER SOLAR COLLECTORS? The main advantages of a heat pump are the ability to re-heat a geyser a few times per day and that it can work day and night, rain or shine. A solar system will only save you more money if its capacity exceeded its demand which is highly dependent on the usage pattern. The Eskom rebate of between R3668 and R4320 depending on geyser size, is taken directly off your quote no waiting for repayments, where Solar you will have to wait up to 8 weeks for your repayment. HOW LONG DOES A HEAT PUMP TAKE TO HEAT WATER? An 4.7kW heat pump will heat the water slightly faster than a 4kW electrical element typically found in 200L geysers. The heat pump produces 4.7kW of thermal energy under specified conditions while using as little as 1.2kW to do so. DOES A HEAT PUMP NEED MAINTENANCE? Our heat pumps range requires virtually no maintenance of the system except for making sure the evaporator is clean from dirt and leaves. We do however recommend that the system be checked annually to ensure that you are getting the best possible efficiency out of the system. We have a monthly eminence plan called Heat Sure which also extends our product warranty to 5 years. Our Heat Pumps should last for up to 10 years. A typical family of 4 that uses water very conservately uses about R500 of electricity per month to heat water. Installing a heat pump will guarantee you a instant saving of about R350 per month which means the machine will pay for itself in less than 3 years.